The Bedford First Parish Church located at 75 Great Road is holding it's 4th annual Haunted House this Friday from 6-9pm and Saturday from 1 to 4pm and 6-9pm. I recently spoke with Gene Kalb, who is heading up the promotion of the Haunted House. According to Gene, the Haunted House is done for the community and as a fundraiser for the Church. This year which is supposed to be a little scarier than previous years, has a Monster theme with different rooms for different movies and tv shows such as a Twilight Zone Room and a Zombie Room. The Haunted House is open to everyone, although Gene mentioned that the "scarier" stuff after 6pm is not recommended for younger children. Most of the scary people in the haunted house are the kids and adults from the church. It takes most people about 30 minutes to go through the Haunted House. Gene is expecting about 1,000 people this year, up from about 800 last year. In addition this is the first year that the Haunted House is open for 2 days. Many local business have sponsored the event, mostly by buying tickets in advance and then giving them to their customers or employees at no cost. 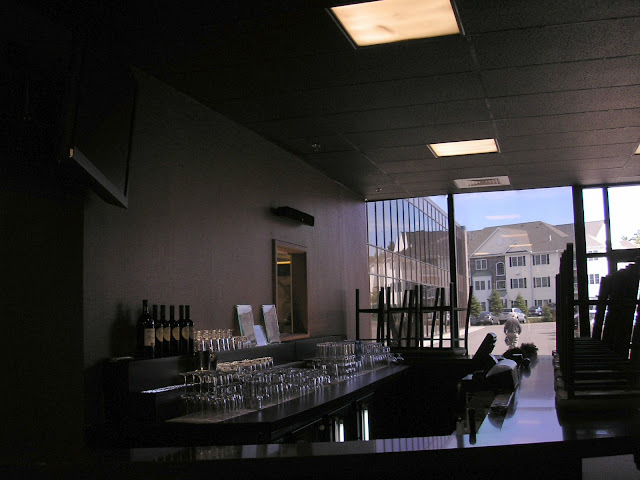 The Boardroom Bistro opened on August 23rd at 54 Middlesex Turnpike. I recently spoke with David Smerling, one of the owners. David and his business partner Jeff, have own the two buildings (that houses office space and The Goddard School at 52 Middlesex Turnpike). The partners thought that adding a restaurant to the building would be a big plus for tenants and decided they would do it themselves. This is the first restaurant they have opened (David mentioned he has lots of experience in eating while Jeff has more of a culinary background). 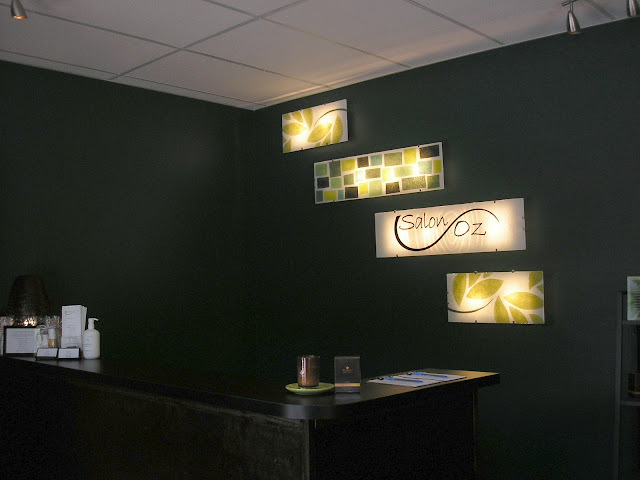 With the location on Middlesex Turnpike near Crosby Drive, they figured that most of their customers would be from nearby businesses and so choose a name they thought would be a good match, along with a company "Boardroom" theme. The restaurant was designed so nearby workers can come by for a quality meal and still get back to work fairly quickly. Customers order at the counter, they receive a chess piece to place on their table, and the order is delivered to them. The restaurant has 96 seats which includes 3 outdoor tables. In addition, the restaurant features free WiFi, online ordering and take out (including drive up). They currently have 4 employees and hope to add a few more as business ramps up. 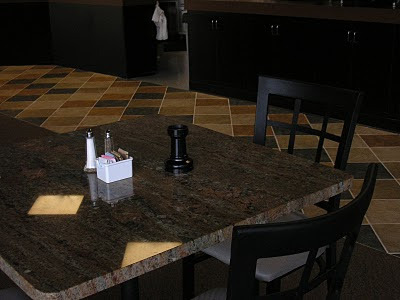 The restaurant is open Monday through Friday from 7am to 7pm and features Breakfast Sandwiches, Burgers, Deli Sandwiches, Salads, Smoothies, Pastries along with personalized coffee. 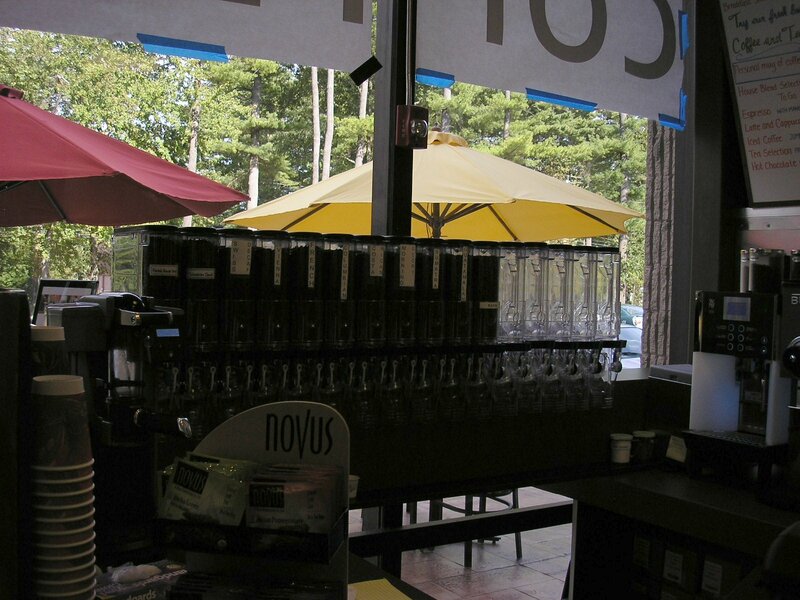 Customers can customize their coffee by choosing from a wide selection of whole beans. 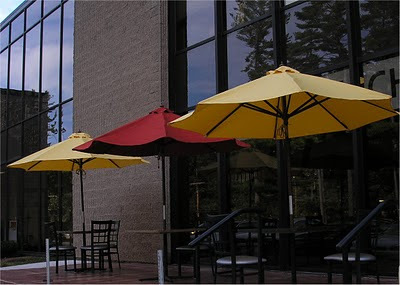 The Boardroom Bistro offers corporate catering and they are willing to rent out the restaurant for functions on the weekend when the restaurant is normally closed. 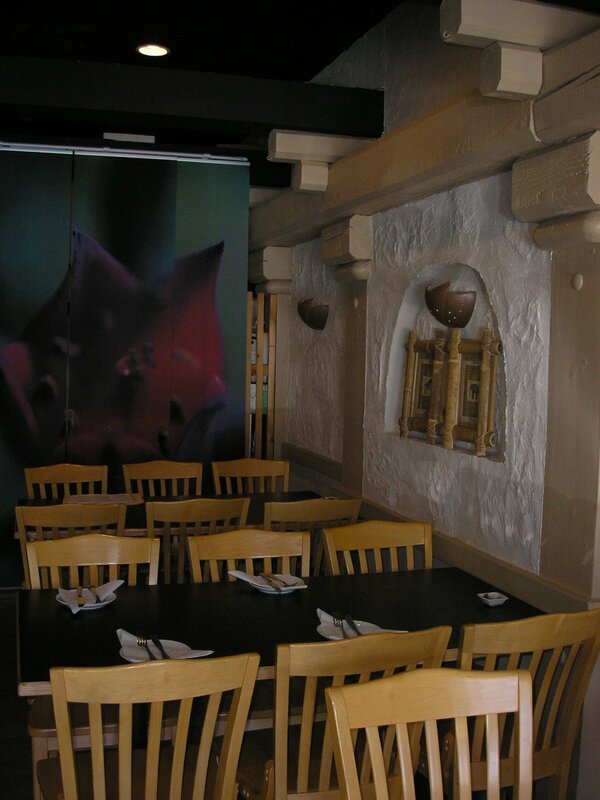 The restaurant features an open setting area with free WiFi. According to David, lunchtime has been very busy. Most of the customers have been from nearby offices. He has seen a few Bedford residents but realizes his restaurant is "on the other side" of town. He is interested in getting more involved in the community such as sponsoring a local team. After ordering, customers are given a unique Chess Piece that is picked up when the food is delivered to the table. 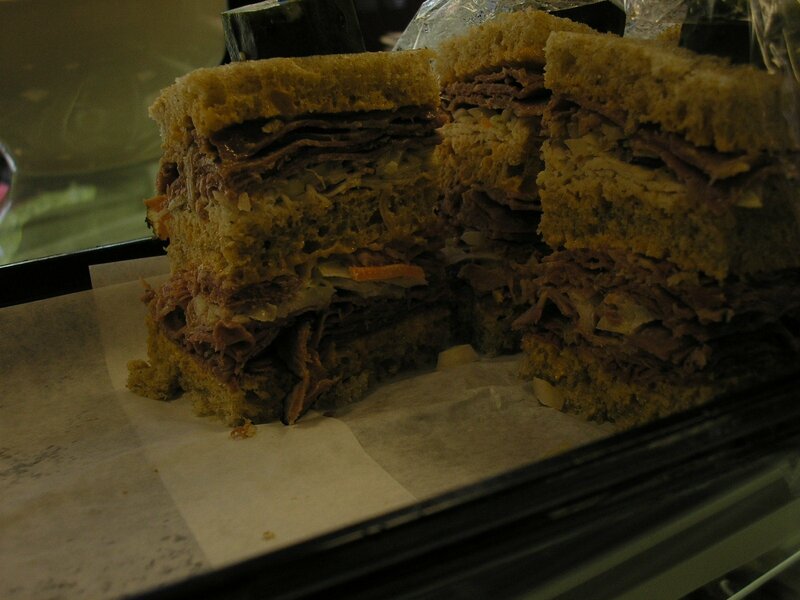 The Jersey Joe Triple Decker is a Boardroom Bistro speciality. The restaurant claims to have the best hot corned beef on rye this side of NYC. Along with the typical pastry items, the restaurant also features Greek, Italian and Jewish Specialities such as Mandel Bread. Right behind the restaurant, is the Goddard School. David, envisions that parents will stop by for a cup of coffee or a quick bit when dropping or picking up kids. The Boardroom Bistro will soon offer drive up service behind the restaurant. Workers will come out and bring the order directly to your car. The bar area is open from 4pm-7pm for customers who want to enjoy a cocktail with their meal. The restaurant features an outdoor patio that can seat 14. A permanent sign should be added shortly. This area of town has been missing a nearby restaurant where you can grab a quick bite. The closest similar places were Famous Pizza on Bedford Street in Burlington and Subway on Middlesex Turnpike in Billerica both about 1 1/2 miles away. As previously mentioned, a new restaurant called Pedro's has just opened across the street in Billerica at the old Naked Fish location. Lola's restaurant was supposed to open earlier this year in Taylor Pond but still appears to be delayed. Phase 2 of the Middlesex Turnpike Widening Project is just beginning. When completed (currently scheduled for Spring of 2013), the road will be 2 lanes in each direction along with a turning lane and a sidewalk on the south (aka Bedford) side. The widening will all take place on the south side, bringing the restaurant about 30 feet closer to the road, increasing it's visibility (currently the restaurant is hard to spot while driving by). It will be interesting to see if the sidewalk brings any foot traffic since the Heritage at Bedford Springs and Taylor Pond apartment complexes are just a short walk away. 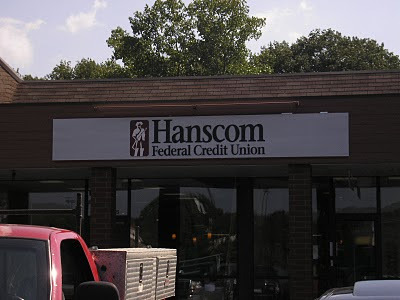 The Bedford Hanscom Federal Credit Union had it's official ribbon cutting ceremony on Tuesday to commemorate the completion of it's renovation and expansion. As previously reported, the branch has expanded in to an adjacent store front and has been completely modernized with a open floor plan that eliminates the traditional teller stations and lines. 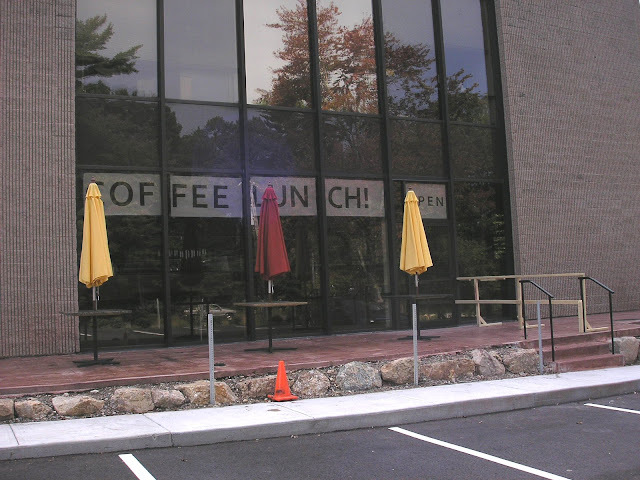 The Boardroom Bistro recently opened at 54 Middlesex Turnpike, next to the Goddard School. The new restaurant is currently open for lunch. Stay tuned for a more in-depth article. Just down the street, Pedro's is set to open by the end of September. This new restaurant is replacing the Naked Fish which closed earlier this summer. The menu is expected to feature Latin Cuisine and is an offshoot of La Casa de Pedro in Watertown. The Hanscom Federal Credit Union (HFCU) branch located at 325 Great Road in the Great Road Shopping Center is scheduled to complete it's expansion on September 10th. 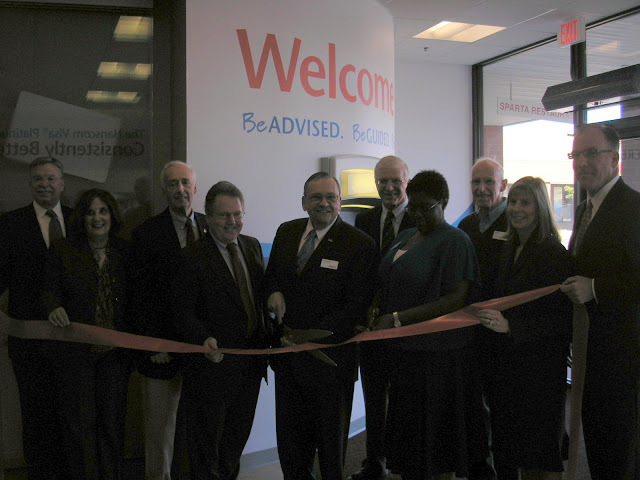 The main Bedford branch, which opened in 2002 is one of 14 branches at HFCU that service close to 45,000 members. The branch which was originally 2500 square feet, is expanding in to the previous location of Bedford Jewelers (which itself moved 3 doors down, taking over the space of the Bedford Laundromat whose lease was not renewed). As part of the expansion (the space will now total 3700 square feet), the entire branch was redone. I recently spoke with Scott Post, Senior Vice President of Strategy and Delivery. Scott mentioned that as the bank had added members and extended hours, it has outgrown the space. Rather than just add a few more teller stations, they wanted to focus on maximum use of space while using technology to automate mundane tasks. 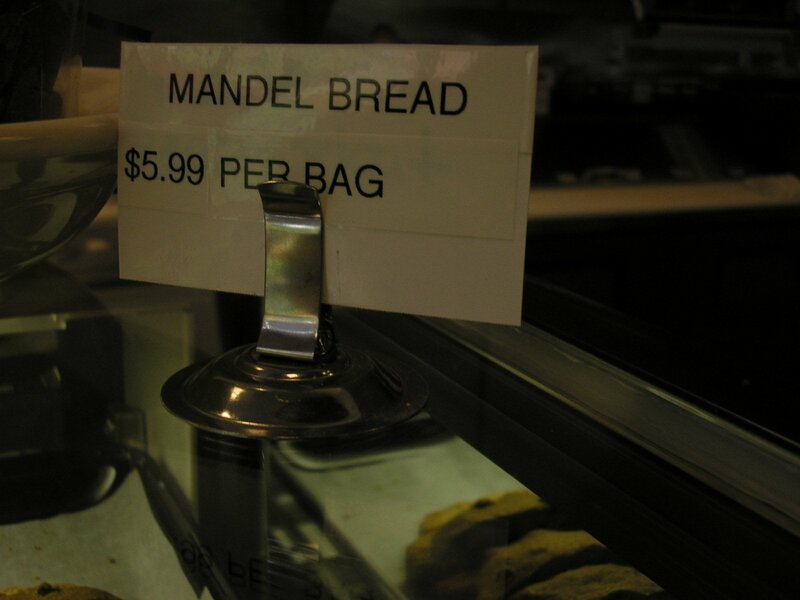 In addition they wanted to simplify the experience for the customer. So the new design, gets rid of the traditional teller stations and lines. In it's place, is an open floor plan. 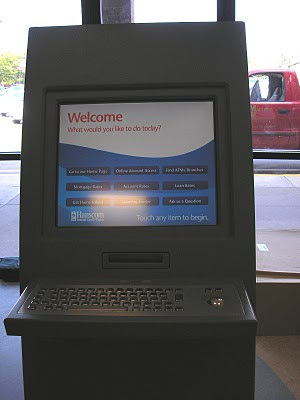 When a member/customer walks in to the bank, a greeter welcomes them, finds out what services they are looking for and then a service representative will take them to a service pod to conduct any transactions. The service pods were designed with circular work desks so representatives can work side by side with members. According to Scott, the advantage of this approach is the customer doesn't need to figure out where to go and they will get serviced by a single representative. While the number of employees will stay the same, the workers have been cross trained so they can take care of just about any member banking needs. Along with the updated service pods, the cash draws have been replaced with cash recycling machines that automatically count and dispense money. This updated retail banking concept, which is according to Scott the first in Massachusetts; is commonly referred to as Dialogue Banking (as it enables the bank employees to better focus on dialogue directly with customers rather than spend time on more mundane banking tasks). The updated technology also keeps track of the number of members who enter the bank over time, enabling the branch to fine tune staffing requirements during the day. 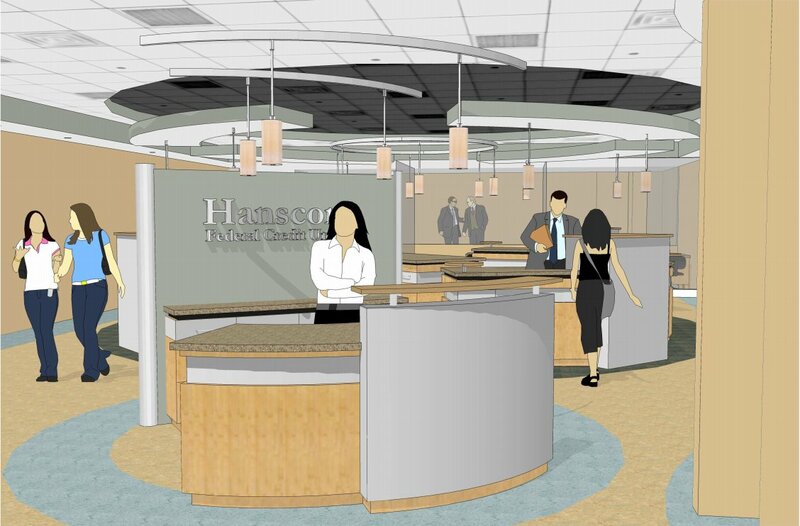 Scott also mentioned that along with the branch changes, HCFU will also focus on tailoring services to each member. For example, all members get a free credit report. As part of this report, the representative may notice a car loan that has a relatively high rate and can calculate how much money they could save with refinancing the loan. Then if the member agrees, they can put proceed with the paperwork right at the service pod with the same representative. A new sign accompanies the expansion. 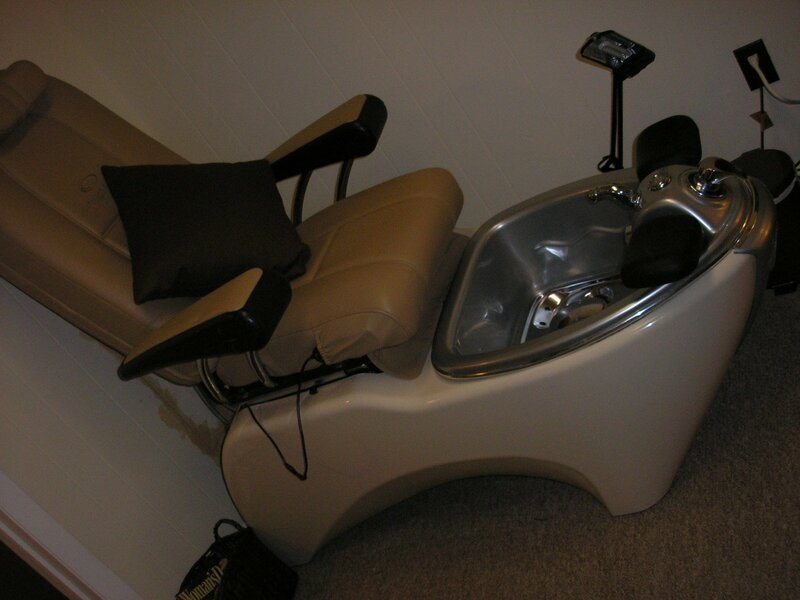 The updates include more modern graphics and colors and is fully ADA compliant. The "official" grand re-opening is set for September 21st and the branch is planning some special promotions for the weeks that follow. The redesign adds 2 touch screen internet kiosks which can be used for online account access. The new Kiosks feature a motion sensor that will automatically log you off when you step away from it. 1. 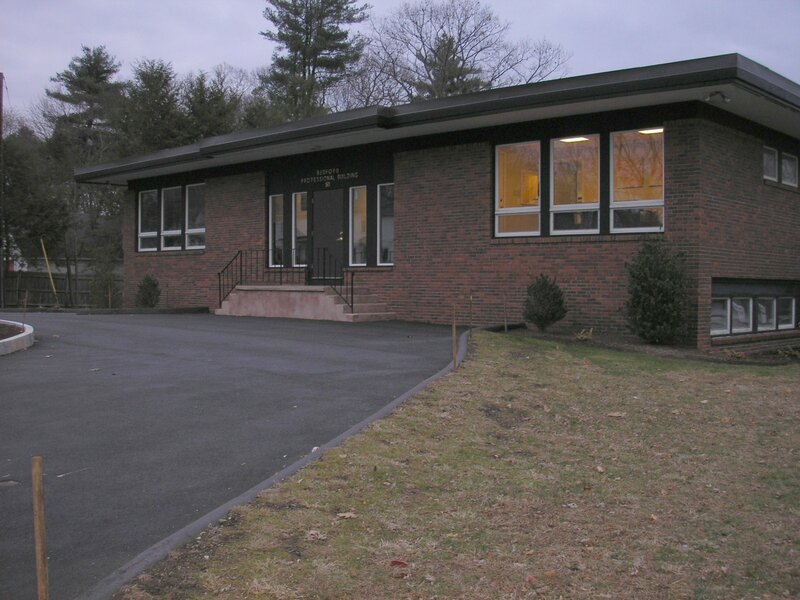 Several of the banks in Bedford have recently undergone lobby renovations. While they have all updated to a more modern look and design, HCFU appears to be the first to go to a Dialogue Banking concept. This concept was popularized several years ago on the West Coast by Washington Mutual (WaMu). What's interesting is that so far, it's been mainly the smaller Credit Unions that have been pushing this trend eastward. This is opposite many other retail businesses where the larger stores like Starbucks are popularizing new retailing concepts. As far as Dialogue Banking, the key to success will be reduced waiting and better service. If this can be accomplished than I think this concept will spread to many of the other branches in Bedford. 2. HCFU's approach in targeting specific services to individual customers is more efficient from a business perspective than just shotgun blasting out marketing collateral for refinancing. How many people have Comcast or FiOS and still get multiple flyers from them every week? 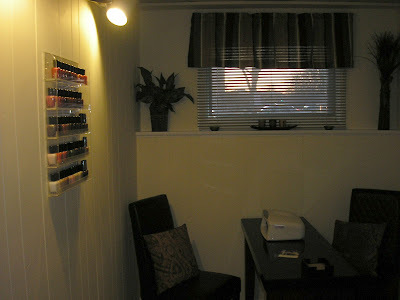 TL Nails Spa recently opened at 44A North Road, next to Walcott Appliance. More details coming soon. 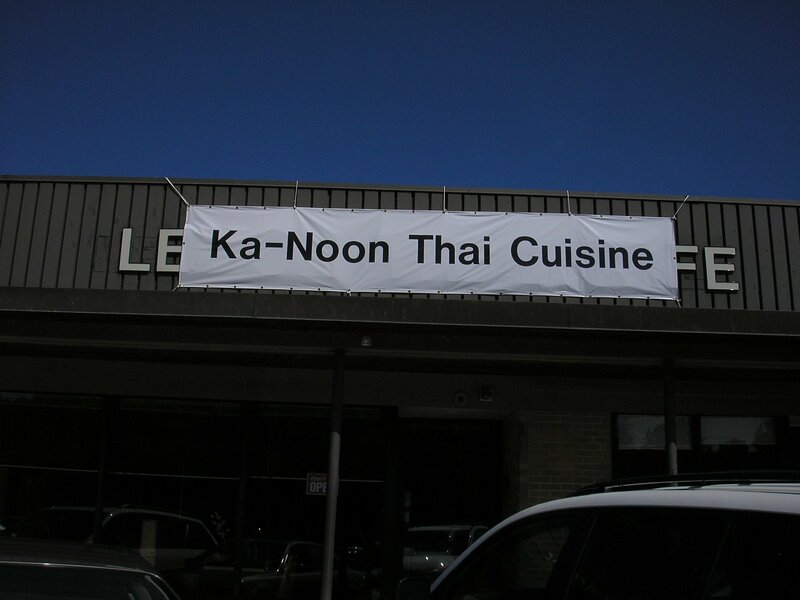 Ka-Noon Thai Cuisine Restaurant Opened May 29th at 168 Great Road at the former location of Lemon Tree Cafe in the Bedford Marketplace. I recently spoke with Malee, who works at the restaurant. According to Malee, the restaurant was purchased outright from the Lemon Tree Cafe (the other Lemon Tree location is Burlington is still open). The restaurant is operated by 2 partners which have operated Yoong Tong Thai Restaurant in Northborough for the past 10 years. 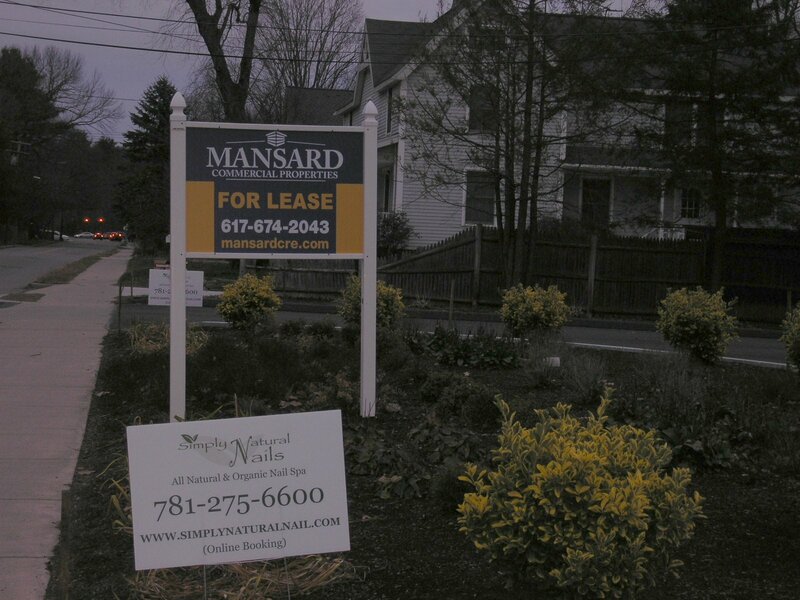 The partners were looking for a new location and really liked the Bedford area. 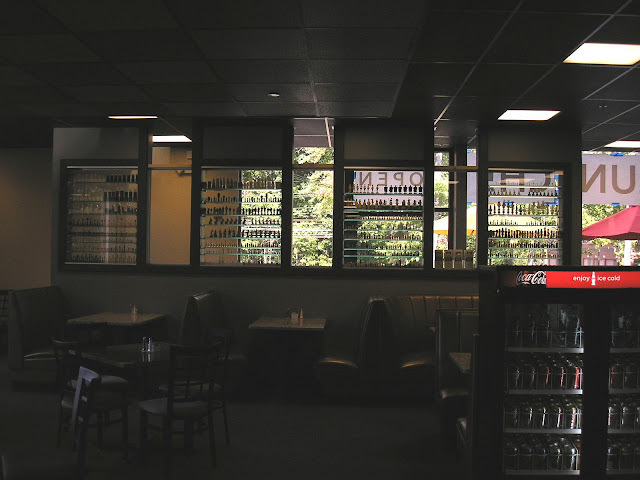 While the restaurant equipment and furnishings were purchased, the interior of the restaurant was renovated giving it a more modern and slightly more upscale look. 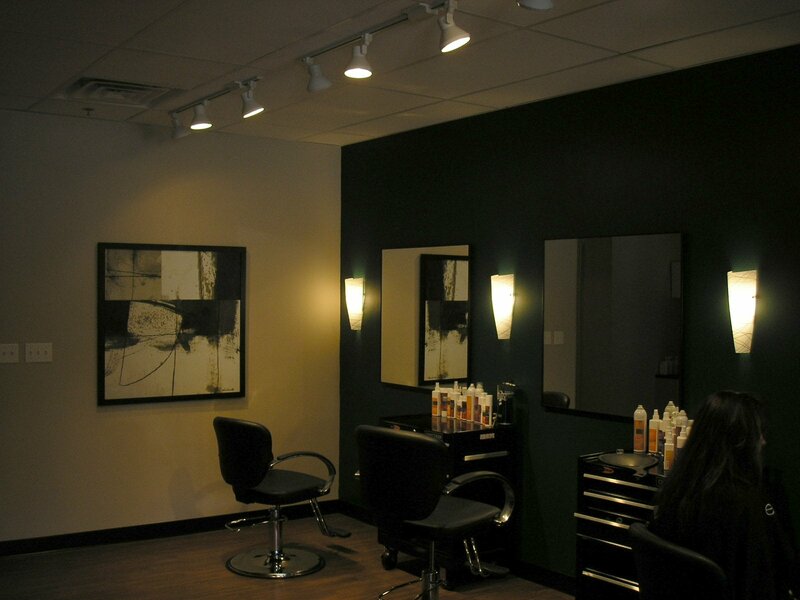 The renovated interior includes recessed lightning and artwork and a small bar area. 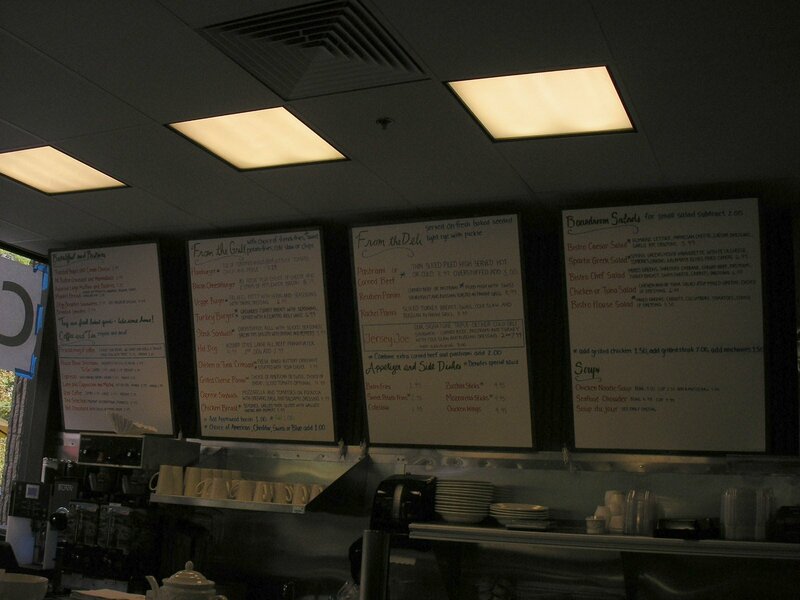 Along with the interior changes, the menu was revamped. It's still Thai Food with a few other Asian dishes such as Salmon Teriyaki and Wonton Soup, but the focus is on emphasizing healthy foods, what Malee described as "True Thai". This fits in well with the name of the restaurant, Ka-Noon which is a popular fruit in Thailand. According to Malee, the most popular dishes so far are Red Snapper and Curry. 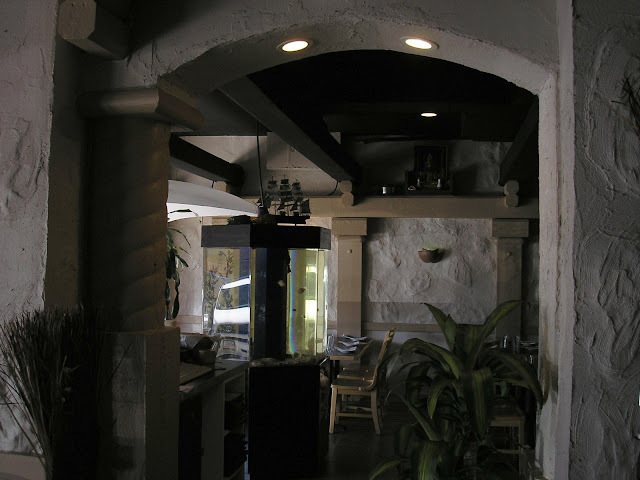 While much of the interior has been redone, the old fish tank from Lemon Tree Cafe has been retained. 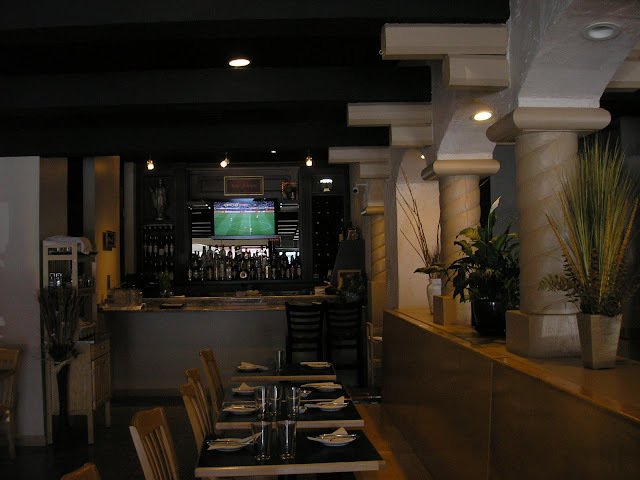 The restaurant features both a Lunch (Mon-Sat) and Dinner menu and does offer delivery. A more permanent sign is expected soon. It will be interesting to see how the new restaurant does as Asiana Bistro and Ginger Restaurants are just a few blocks away. Lemon Tree Cafe never seemed to be very busy. I don't recall them ever advertising which I think was part of the problem. My advise to Ka-Noon is to reach out to both Bedford residents and workers. Yelp seems to becoming an increasingly popular service for reviews of restaurants and other retail businesses in Bedford. The Bedford Farmers' Market is set to begin it's 3rd Season on Monday June 14th across from Depot Park. I recently spoke with Co-Founder Barbara Purchia. According to Barbara, the Farmers' Market is adding 10 new vendors this year including fresh pasta, artisan cheeses, Lebanese and Egyptian food and more. Besides adding new vendors, one of the goals for this year is customer education such as composting demos and seed planting for kids. While the Farmers Market was pleased with the growth in 2009, things slowed down in July and August as many people went away for the summer. For this year, Barbara and her team plan to combat this with additional activities such as weekly entertainment throughout the summer. In addition, there are future plans to add a marketing person. As far as Iron Chef Bedford, Barbara mentioned that while it was successful getting people out, it did not seem to benefit the vendors. Iron Chef is being replaced by Taste of the Market in which a company will showcase what is in season. For example on Labor Day, Flatbread Pizza is bringing their portable pizza oven to the market and will add all the toppings from the local vendors and will then cook up some pizzas. According to Barbara, the long term goals of the Bedford Farmers' Market are to continue to grow and help educate residents on the importance of what you eat, where your food comes from and how the food is grown. Barbara also stressed the importance of community in terms of being able to have conversations with people you run in to at the Farmer's Market, something that she thinks is lacking at the supermarkets. 1. While I think the additional vendors and activities will help with the growth of the market in 2010, one component still missing is outreach to employees who work but do not live in Bedford. In my informal talks with nearby workers last summer, many people were unaware of the Farmers Market which was going on just a few blocks away but had a pretty positive reaction upon hearing about it. Perhaps some flyers distributed to some of the nearby office parks would boost awareness. 2. It is nice to see the Bedford Farmer's Market website take advantage of mostly free basic web tools such as Google Calendar and online scheduling for Volunteers (although I do recommend they add Twitter). This is something that many local Bedford retailers do not take advantage of. Twitter 101 for business is probably a good place to start. The main treatment area. More equipment such as Treadmills is expected soon. 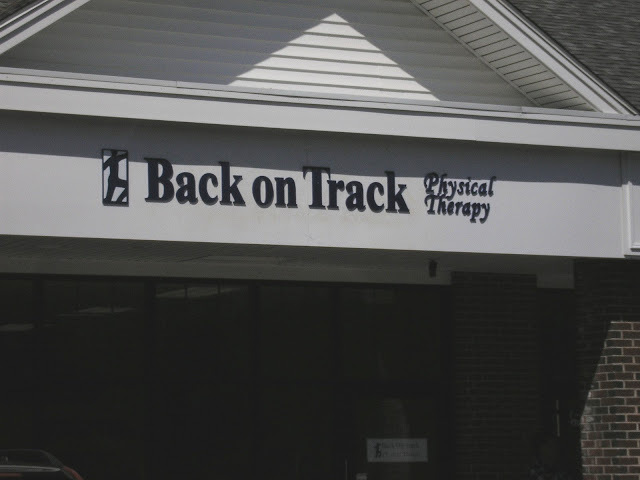 Back on Track Physical Therapy recently opened it's seventh location in Bedford at 186 Great Road in the Blue Ribbon Shopping Plaza at the former location of J. Gregory Lamp and Shade. I recently spoke with Susanne Nasson, the General Manager. Back on Track, which opened it's first location in 1999, had previously sublet space from the Burdenko Institute for Aquatic Therapy at the Bedford Veterans Hospital until last fall, when the VA ended the lease. 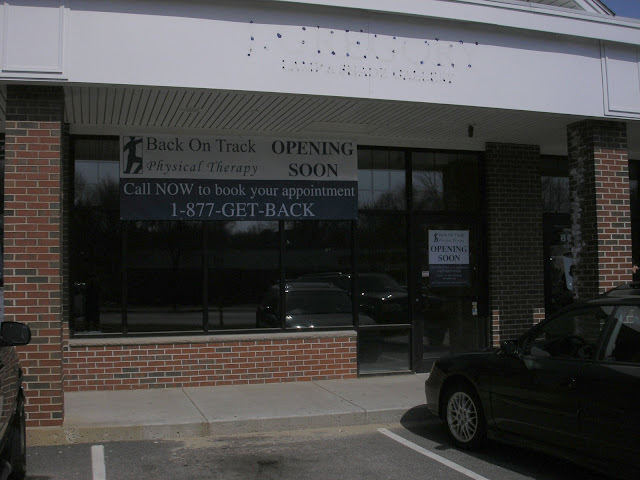 Since most Back on Track clients were from the local community (mainly Bedford, Concord and Lexington), Back on Track had been looking for a new space in the area. The new location, which had a soft opening on May 5th, is actively looking to work with a local pool in order to offer Aquatic Therapy again. Susanne mentioned that 80% of their local clients want Aquatic Therapy. According to Susanne, the Back On Track therapists blend traditional physical therapy methods with holistic programs to provide a full range of care. Back on Track also offers one on one treatment in private treatment rooms. Paul Salvi, the Clinic Director for the Bedford location, had worked at the Bedford VA for many years and is well known to many Back on Track clients. 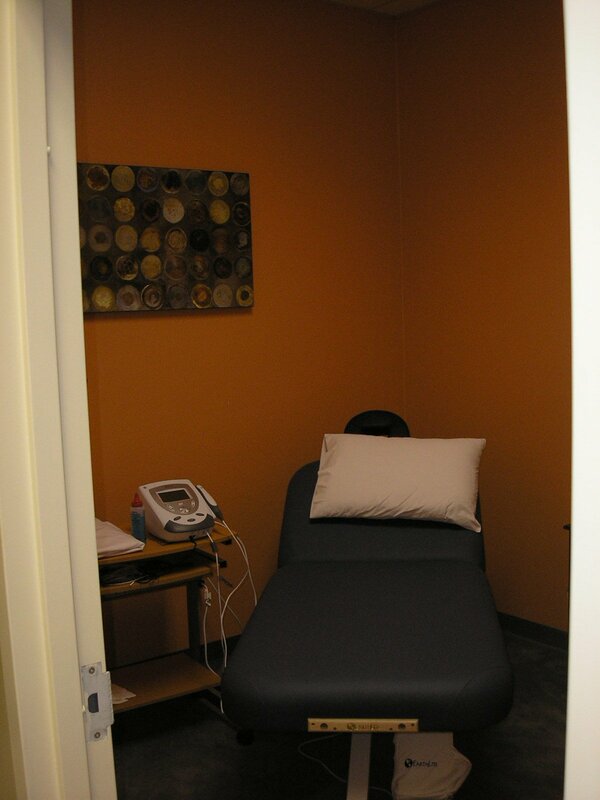 One of the private treatment rooms. 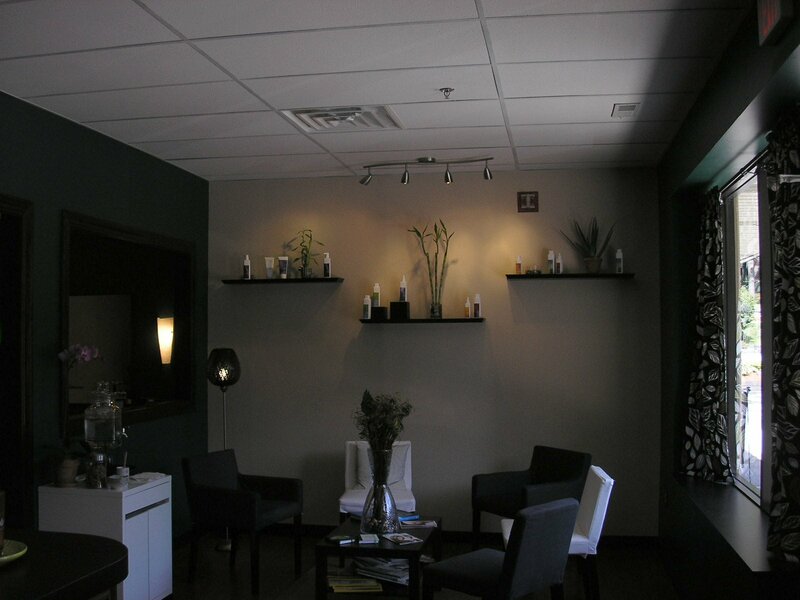 The room was designed to offer a soothing experience. Back on Track has recently started taking referals from Lahey Clinic. In addition to offering physical therapy, Back on Track is also planning to add Wellness Programs, including Yoga classes and is also looking in to Massage Therapies. The Bedford location currently has 4 employees and is looking to add another 4 as business ramps up. They are planning a Grand Opening Celebration in Early July. 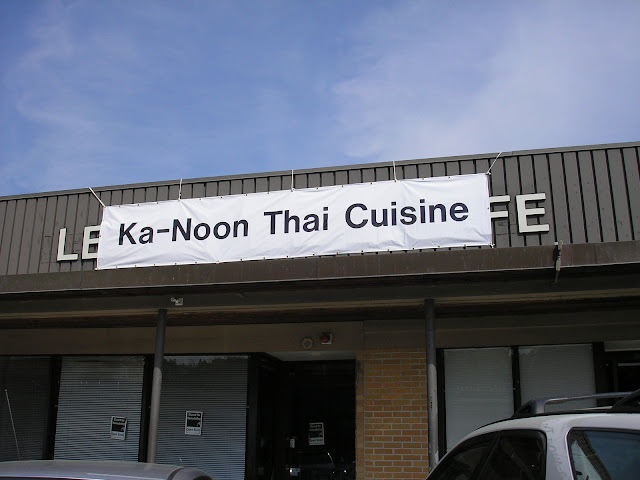 A new Thai restaurant, Ka-Noon Thai Cuisine is set to open at 168 Great Road by the end of the month. The new restaurant, which is located in The Great Road Marketplace (aka Bedford Shopping Center), replaces The Lemon Tree Cafe. The interior has been remodeled and the restaurant will feature an all new menu. According to the staff, the restaurant was purchased from The Lemon Tree, which still has a remaining location in Burlington. Expect a more in-depth report, after the restaurant opens. 1. 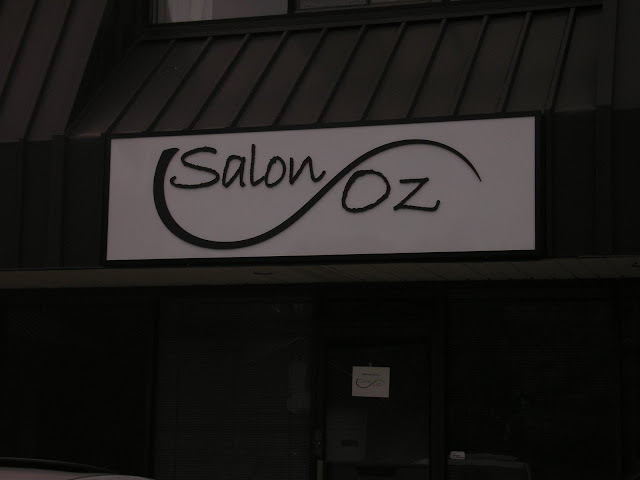 Salon Oz. This is a new hair salon at 363 Great Road at the former location of Bedford Photo.The Salon is still under construction but is expected to open soon. Construction is ongoing at the former Photo Store. 2. Bloom opened today at the former location of The Paperback Exchange at 68 Great Road, which closed less than one month ago. Bloom is a housewares consignment shop that is run by Elizabeth Nemirovsky, the Owner of Auntie's Erl's Exchange (which is in the process of closing it's doors). Bloom is the fourth 'Home Decor' focused shop on the Blake Block. 3. Back on Track Physical Therapy recently opened at 186 Great Road (Blue Ribbon Plaza) in the former location of J Gregory Lamp & Shade Gallery‎. This is the 7th location for Back on Track. 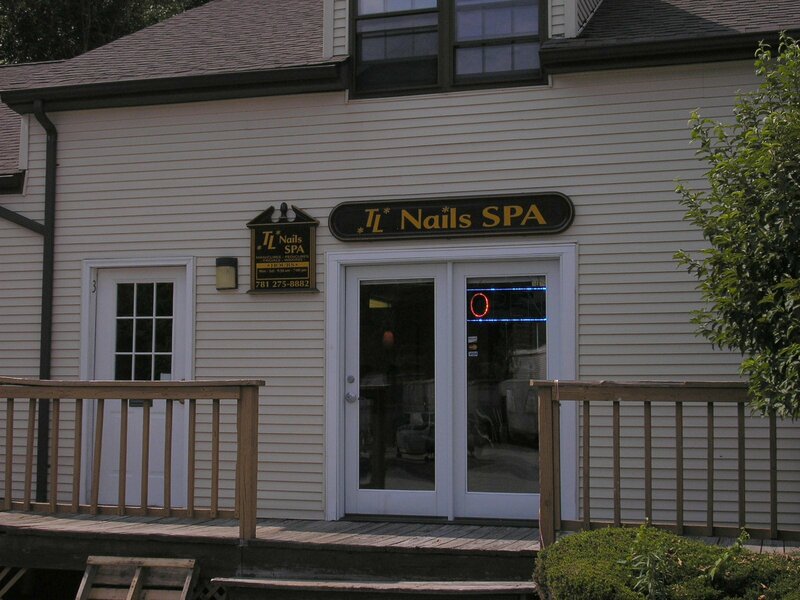 Their other locations are Brookline(2), Cambridge, Danvers, Newton and Waltham. Expect in-depth reports on all 3 businesses later in the coming weeks. 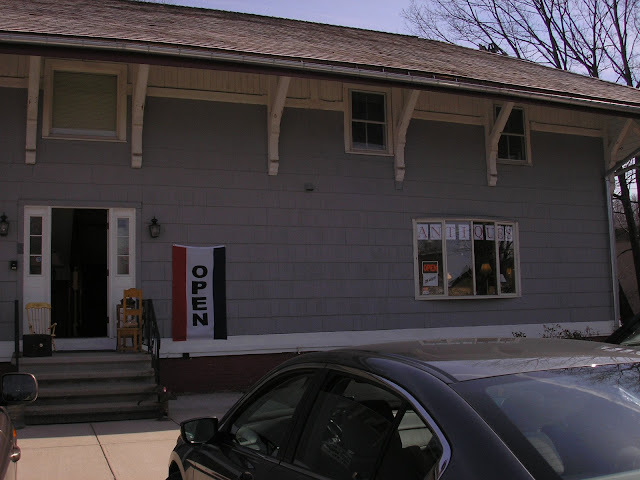 JRM Antiques held it's grand opening on March 17th in the Bedford Depot Building at 80 Loomis Street. I recently spoke with John Monahan, it's owner. John has been an avid collector for the past 15 years. He started collecting as a hobby then he expanded to become a Power Seller on eBay as well as a volunteer to help others price and sell their collectibles. About a year ago, John retired from his day job to spend time boating and golfing. Shortly after his retirement he saw an advertisement soliciting request for proposals (RFP) for the Bedford Depot Building. He thought that since the building was already very historic, it would be a great place to sell antiques and collectibles. So he filled out the RFP and on December 21st, was awarded a three year lease for one of the rooms (about 530 square feet) in the Bedford Depot building. 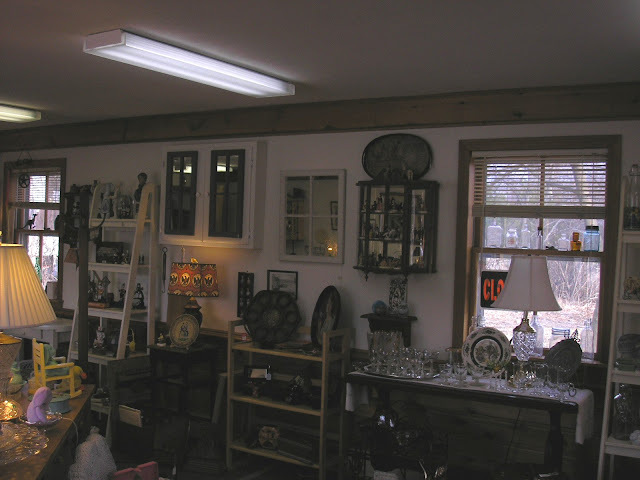 The store features items from the 1850's through the 1970's. JRM Antiques focus is on Antiques and Collectibles for three periods: Nouveau Art (which John considers mid to late 19th century), Art Deco (mainly 1930's) and Modern Art (1930's-1970's). The store features a wide variety of products ranging from about $5 to $850 with most products in the $15-50 range. In fact, some of the original items he collected are now in the store. When the store acquires antiques, it spends time cleaning them up and does a lot of research with guides such as Kovels to set pricing. 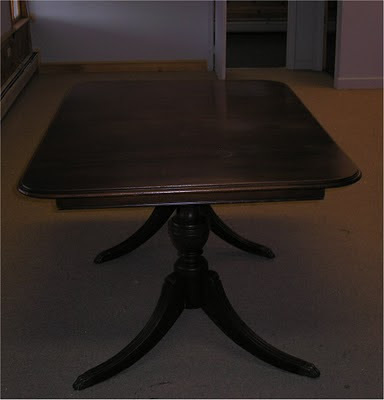 A recently acquired table is being cleaned up in preparation for display in the store. One thing John really likes about the antique business is the close relationships with customers. 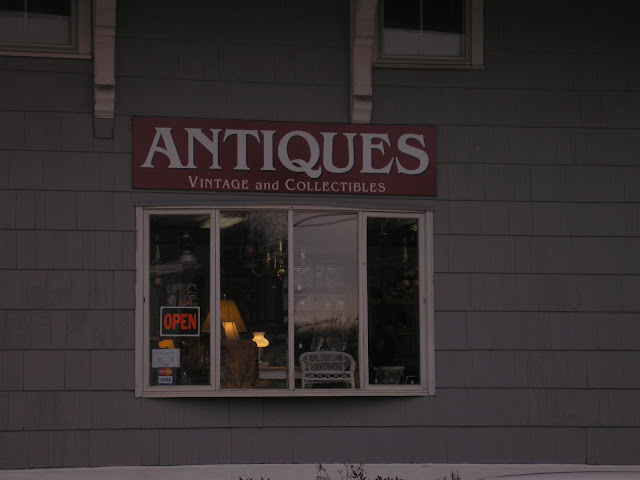 According to John, antiques stores tend to have lots of interaction with customers and typically wind up a first name basis. The store does take items on consignment and also will go to estates to offer advice. 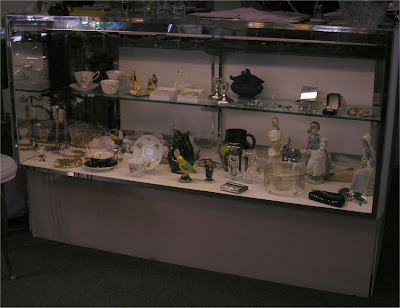 The display cases features some of the consignment items. John has been very pleased with the store opening. He states that he gets a lot of traffic from the Minuteman Bikeway and has gotten customers who have biked in from Arlington, Cambridge and Boston and then seen his store. According to John, a lot of bicyclists come by to browse and then will come back later to make their purchase, although he has sold a few items that wound up placed precariously on the bike for the ride home. The view from the Minuteman Bikeway which has been a large source of customers. The Store is Open Thursday through Sunday but stays open until 8pm on Thursday which according to John, has been very successful. John is also working on a website for the store that will also include more high end items. As far as future plans, John is in the planning stages of working with the Bedford Historical Society to put together a show in Town. John is also looking forward to working with the Bedford Farmers' Market. 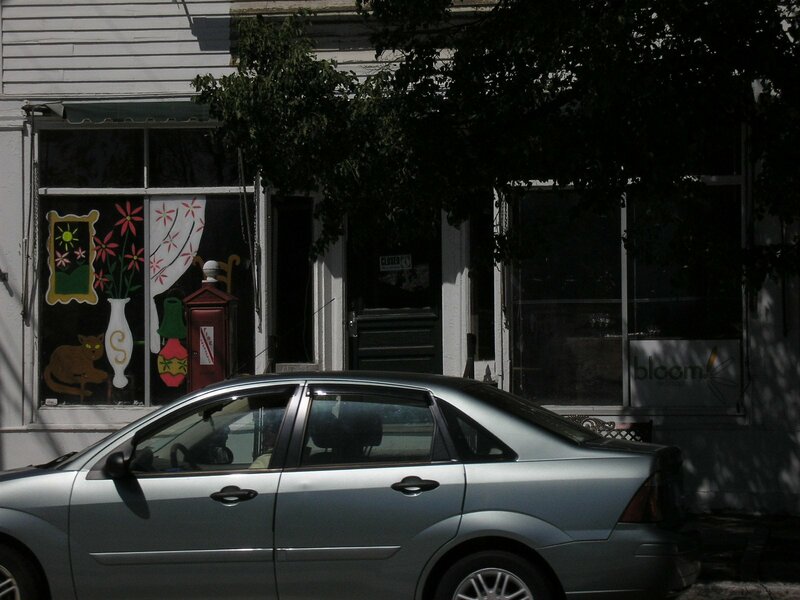 Ultimately he would like to expand his store in to one of the adjacent vacant storefronts in the Bedford Depot and add small furniture to the list of items he carries. Front of the Bedford Depot Building. Several rooms in the building are still available for rent. The recent renovation of Bedford Depot Freight House along with the new retail business is proving benefical for the Depot Park area. The area looks a lot better and is attracting a lot more people and is becoming a destination. I think the final piece of the puzzle would be the addition of a restaurant. 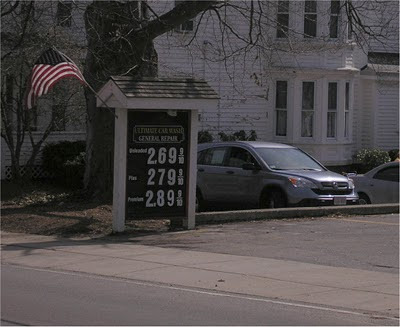 While the Bedford Depot building is probably too small for a full service restaurant (although possible in another nearby building), the addition of a small cafe or even a seasonal Ice Cream shop would be a nice addition. In a bunch of my recent discussions with new retail business owners in Bedford, many of them have had to face unexpected hurdles with the town resulting in delays and additional costs in opening their businesses. While many of these zoning/permitting/signage hurdles are reasonable from a town perspective, they can be mostly be mitigated with advanced knowledge by the business owner. Some of the surrounding towns such as Lexington, offer a liaison to help guide new retail business owners and attract new businesses. While this may not be economically feasible for Bedford, this might be a good role for the Bedford Chamber of Commerce to proactively take on. For example, the chamber could work with landlords and review new Bedford business licenses to seek out new businesses and then send out a guide/checklist on opening and running a business in Bedford. Not only would this help smooth the new business opening, but would also likely boost membership in the Chamber as the new businesses would see the immediate value that the Chamber is providing. It's been a quiet few months for Bedford Retail, but now with the change of season, things have begun picking up. 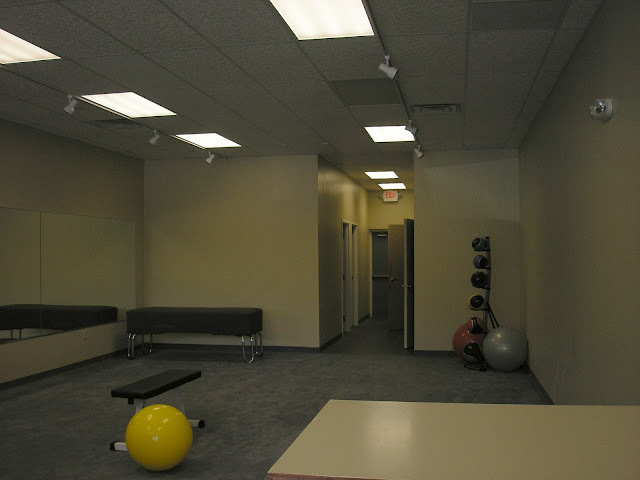 First, Back on Track Physical Therapy is set to open soon at Blue Ribbon Plaza in the former location of J. Gregory Lamp & Shade Gallery. This will be the 7th location for Back on Track. 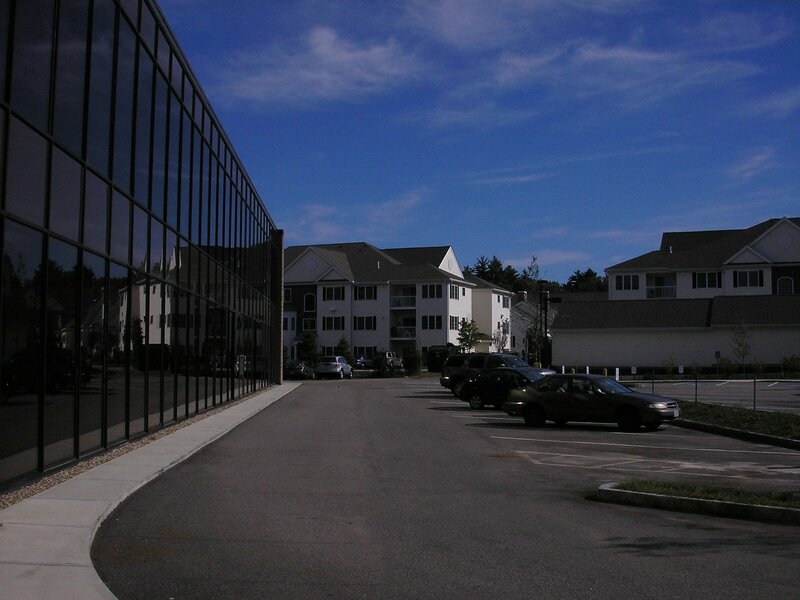 They have existing locations in Brookline(2), Cambridge, Danvers, Newton and Waltham. 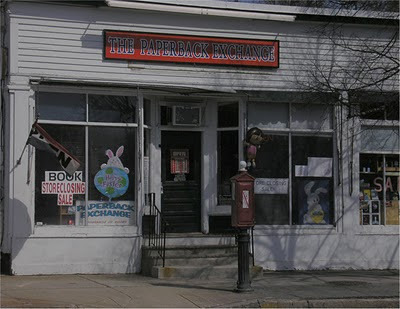 The Paperback Exchange which opened in December 2008, has decided to close it's doors. The store has had a "Bookstore for Sale" sign in it's window for several months. According to the Owners, the store is most likely scheduled to close on April 17th. In the meanwhile, they are having a store closing sale. 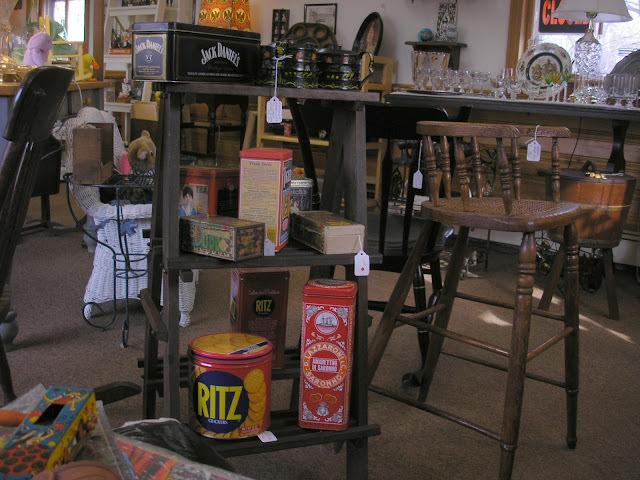 JRM Antiques had it's Grand Opening on March 17th. 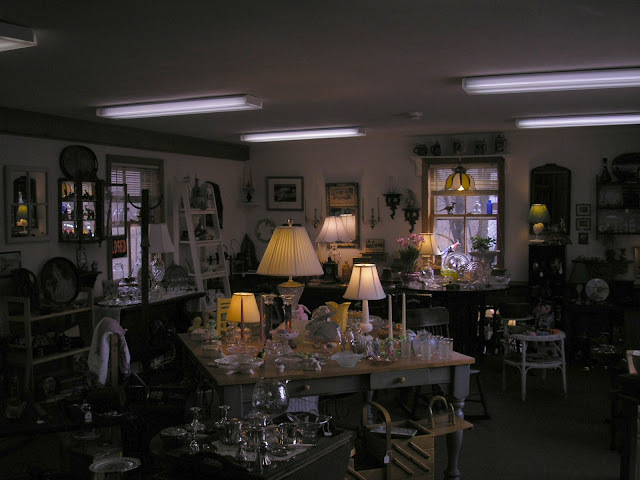 They are located at the Bedford Depot Building at 80 Loomis Street and Feature Antiques and Vintage Collectibles. 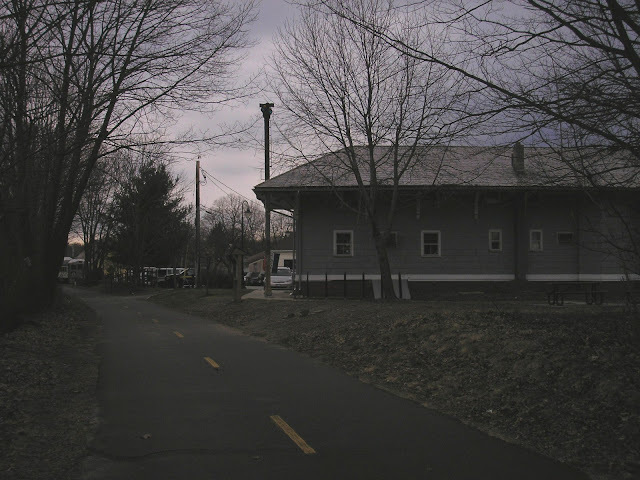 As first mentioned, two years ago, the town put out an Request for Proposals to get new tenants for the old Bedford Depot Train Station. JRM Antiques replied with a proposal and is a new tenant in the building. Expect a more in-depth report, including an interview with Owner John Monahan later this month. Marcell Auto Detailing and Repairs which opened last fall, has changed names and owners. While the existing staff and services have stayed the same, the new name is Ultimate Car Wash and General Repair. 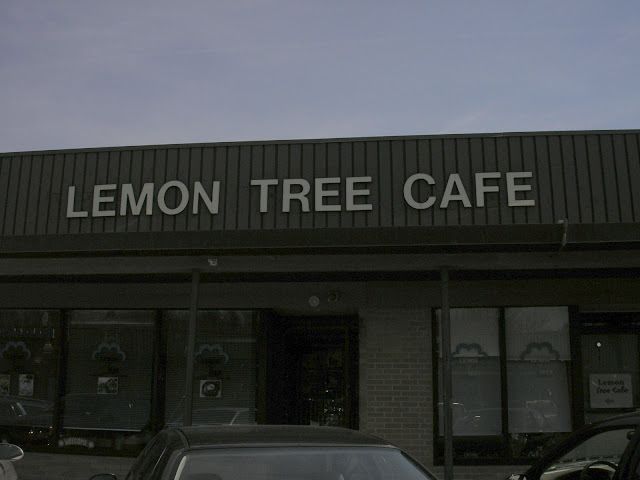 The Lemon Tree Cafe may undergo a name change and new ownership. Although details are sketchy and the existing staff would not confirm any changes, there is a public notice to transfer the All Alcoholic License granted to the Lemon Tree Cafe, to Pakin, LLC dba Ka-noon Thai Cuisine as well as a new Common Victuale's Application for Ka-noon Thai Cuisine. Lastly there has been discussion of expanding The Edge Sports Center of Bedford. While details are not final, it is expected that another indoor Athletic Field would be added to the facility.